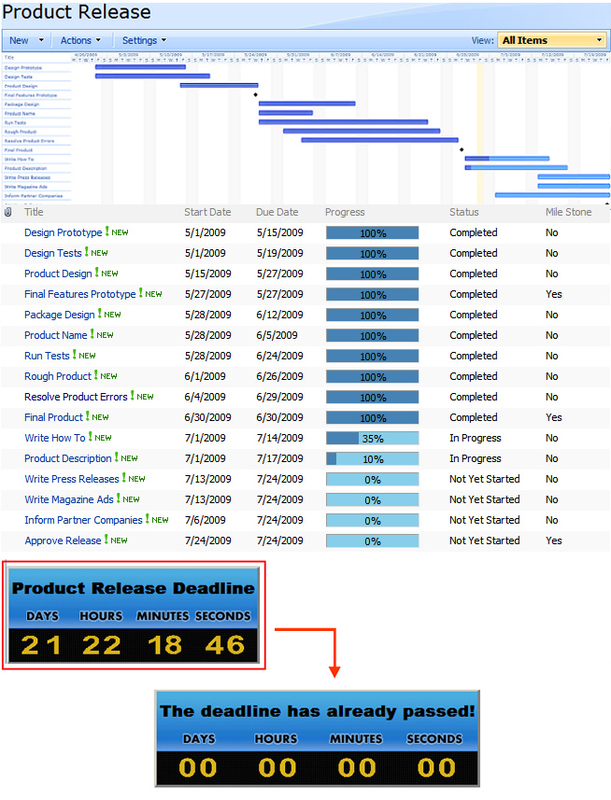 The SharePoint Project Timer web part is a powerful and flexible digital countdown timer that helps remind you of important, upcoming milestones and deadlines. It displays as a digital clock that shows you the number of days, hours, minutes, and seconds remaining until the target end-date and end-time, making it a versatile tool to keep track of time for long-term project planning,including a complete suite of adjustable visual settings, etc. ...... 5 different pre-designed themes, the ability to create new themes, and the capacity to upload images to set as the timer background. The fully-modifiable countdown configuration settings offer further flexibility, from changing number-style settings to controlling whether the countdown includes seconds. And, once chosen, your target date & time are remembered automatically, so even if you close the web part and later reposition it on your web page, the proper countdown time will still be displayed. * Upload and set images as a background. Qweas is providing links to SharePoint Project Timer 1.2.826 as a courtesy, and makes no representations regarding SharePoint Project Timer or any other applications or any information related thereto. Any questions, complaints or claims regarding this application SharePoint Project Timer 1.2.826 must be directed to the appropriate software vendor. You may click the publisher link of SharePoint Project Timer on the top of this page to get more details about the vendor.